An Ajax man’s shooting death at the hands of police was cleared by the province’s Special Investigations Unit, but his family’s own investigation into what happened has raised new questions. Michael MacIsaac was shot and killed by police after bolting from his home naked on a cold morning in December 2013. His family believes he had suffered a type of epileptic seizure. Why didn’t police take more time to assess the threat posed by MacIsaac? Why do two police watchdogs disagree on the distance between MacIssac and the police when the shots were fired? Why is there confusion about whether or not police knew about MacIssac’s medication or if they passed it along to the people treating him? Why did Durham Regional Police send their own investigators to interview the family even though the province’s Special Investigations Unit had been called in? The officer who shot MacIsaac — 12 seconds after leaving his cruiser — was cleared of any wrongdoing in two investigations by the SlU and the Office of the Independent Police Review Director. But the family still insists Durham police mishandled parts of the case. At 10:07 a.m. on Dec. 2, 2013, Durham Regional Police received a 911 call from MacIsaac’s sister-in-law reporting a struggle at the family home as MacIsaac ran out the door. His wife, Marianne, would tell Durham detectives later that day she was panicking because of his odd behaviour. “I was trying to restrain him from leaving because I knew he was delirious at that point, because my husband would never behave that way,” said Marianne MacIsaac. For the next 15 minutes, there was a flurry of 911 calls as witnesses in Ajax reported a man running naked through the neighourhood. Initially, police went to the wrong home address when they answered a radio call about a domestic incident on Anstead Cresent instead of Unsworth Crescent, where the MacIsaacs lived. Police communications described MacIsaac as “aggressive towards police.” But his close-knit Newfoundland family, who say he had no criminal record, was shocked to learn he was described this way and want to know who gave police that description. They believe that radio call may have influenced the officers rushing to the scene. MacIsaac’s wife said he was not an aggressive man, just unwell. “He was a loving and caring husband whose only whose only fault that day is he had a seizure…and it totally changed his behaviour that day,” she said. Initially witnesses saw MacIsaac running in the neighbourhood. Others later told police he was banging on car windows and yelling. Witness Shelley Allen-Groves told CBC News she saw him in her driveway on Dring Street. When she drove in, she says he frantically banged on her car window. She says it appeared he wanted to tell her something. “I wasn’t scared. It was more like, ‘what is this exactly?’ This is odd to see a person without any clothes at the beginning of December,” said Allen-Groves. Allen-Groves didn’t feel threatened, until MacIsaac picked up a boulder from her rock garden and carried it a short distance. She pulled out of her driveway, and watched what happened from her rear-view mirror in her car. Allen-Groves saw MacIsaac holding a patio table on her porch and banging it against her front door. The table came apart just as several police vehicles pulled up. She saw MacIssac carrying a table leg like a baseball bat, walking towards the police cruisers. Allen-Groves said one of the officers got out of his vehicle, drew his gun and fired. She saw MacIsaac stumble and, after a second shot, fall to the ground. The time was 10:23 a.m. — about 15 minutes after MacIsaac’s sister-in-law made the initial 911 call. MacIsaac’s sister Joanne points to a time-stamped video. It shows her brother, covered in blood, 18 seconds after the GPS indicated the officer had arrived on the scene. His sister says watching the images of MacIsaac moaning in pain on the street are devastating for the family to watch. “He must have been so scared,” she said. The family’s lawyer, Roy Wellington, believes the shooting could have been avoided. “There was definitely an opportunity for officers to devise a better plan of approaching Michael, containing him and providing him with the assistance that was necessary,” said Wellington. Later MacIsaac’s family learned that a mental-health officer was one of the three officers at the scene. That officer had just stepped out of his cruiser when the other officer fired. The family has many questions over how police handled the emergency that day. They brought their concerns to the Office of the Independent Police Review Director (OIPRD), the independent police watchdog that investigates complaints. MacIssaac’s family also did its own investigation — knocking on doors, enhancing photos and videos from witnesses, even hiring a private investigator. It also asked an independent forensic pathologist to review MacIsaac’s autopsy. Joanne MacIsaac says her brother’s bullet wounds show that he must have had a reaction to the first shot in his shoulder, before the second deadly shot to his abdomen was fired. The officer who fired told investigators MacIsaac showed no reaction to the first bullet, so he fired again because he feared MacIsaac was going to kill him with the table leg. One of MacIsaac’s sisters is a civil engineer who has reconstructed the shooting scene, taking measurements of the driveway where her brother was shot. 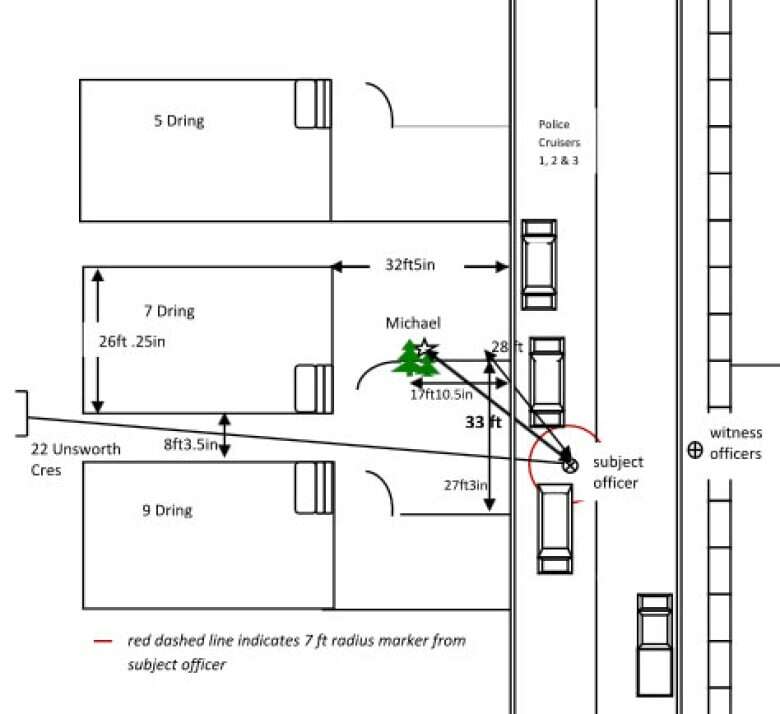 Her research indicates MacIsaac was likely closer to 30 feet away from the officer. The OIPRD report concluded MacIsaac could have been anywhere from 10 to 30 feet away, while the SIU told the family that the distance was five to seven feet. The OIPRD report also finds that there is contradictory evidence about what police knew about MacIsaac’s anti-seizure medication and what medical information they did or did not pass along to the people treating him at Rouge Valley hospital. A police officer told investigators that Marianne MacIsaac, Michael’s wife, was too distraught to provide a list of his medications. But when the OIPRD reviewed radio transmissions that same officer had broadcast the name of one of the drugs. Another officer who was with MacIsaac in the ambulance says that she passed along all of his medical information to a nurse at the hospital. But she couldn’t remember the name of the nurse or what the information was. Her police notes and the hospital record show no mention of MacIsaac’s medications. The family believes without that information MacIsaac had a reaction to another drug administered at the hospital. The OIPRD concluded that the first officer had committed no misconduct. And that misconduct against the second officer could not be substantiated. After MacIsaac was airlifted to St. Michael’s hospital, homicide detectives from Durham were first to arrive to interview the family. Only when the SIU appeared mid-interview did the family realize that they weren’t speaking to independent investigators, but police from the same force that shot Michael. Those Durham officers later told the family they were allowed to do a parallel investigation into the domestic 911 call made that morning. While this was happening, Michael’s wife Marianne was incensed to learn that while the family was at the hospital, police went to the couple’s home. A caregiver looking after MacIsaac’s elderly father who has dementia answered the door. She says the officers entered the home and took video and pictures. She said she could also hear them searching rooms. The detectives denied they did a search and complaints about entering the home without a search warrant were dismissed. The OIPRD report says the officers had the legal right to enter the home to look into the earlier domestic call if the caregiver let them in. But the report also found that Durham police officers contradicted themselves about who asked them to enter the home. “[Durham police] spoke with all the witness first. Witness told us that they were taken to Durham police station to wait for the SIU. You tell me that’s independent?” questions Joanne MacIsaac. Shelley Allen-Groves, the MacIsaacs’ neighbour, confirms police interviewed her and others at the police station hours before the SIU arrived. CBC News asked Durham Regional Police for an interview several times. Lawyer Peter Rosenthal, who has represented other families in police shootings but is not involved in the MacIsaac case, believes the Durham police shouldn’t have been interviewing witnesses before the SIU had done so. “The SIU is the lead investigator and that means that the SIU should do the first interviews of all witnesses,” Rosenthal said. Joanne MacIsaac says she is not giving up on the investigation of what happened to her brother. The family has spent more than a year gathering the details of what happened on that day. They’ve shared much of that information with CBC News, including photos of Michael MacIsaac at the time of the shooting because they believe it’s important to get a full picture of what happened. But the OIPRD has told the family there is not enough evidence to substantiate any of their complaints. MacIsaac’s wife, Marianne, says the family will continue to ask the SIU to reopen its investigation and push police for answers.